May 30 came along too quickly and I just had to have it splashed by then. May 30 was my Mom's birthday and I always like to go for a sail and toast to her life with her favorite drink (and one of mine) a rye & water. I call it the rye & water day sail. Not much different than other sails but this one is official! This year I just made it. On May 30th my son Gavin (13) and I hauled the boat to the lake and with his help we stepped the mast. We launched the boat and went for a burgers & fries lunch at the Hot & Frosty. After lunch we went back to the marina to tighten the shrouds, attach the boom and put on the sails. I had a great time with Gavin helping me this year. It was real nice to spend the time together. Just as we were finishing my brother-in-law Kevin and my niece's boyfriend Zach joined us. It was calm but we managed to find a bit of a breeze and went for a sail and toasted my Mom. She was a firecracker and really lived her life. This year and every year I power polished the boat. It is a 1977 and the paint is very oxidized. By fall it will be faded off again. I use a marine polish but any power automotive polish (with grit) will work. May 30 was approaching so I had to work fast. Every year the white topsides seem to get very spotted and grey. I think it is mildew but the fish flies at the lake also leave a mess. 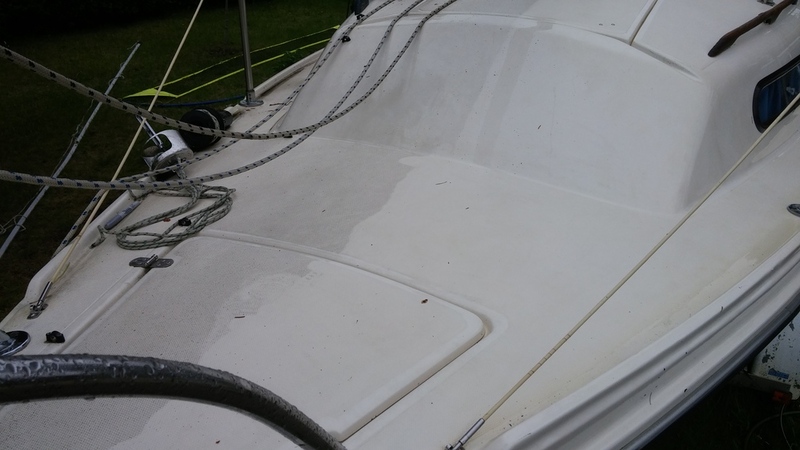 Scrubbing with a brush and rinsing will work but a power washer is soooo much easier. It takes a while but the result is worth it. Real stubborn areas come clean with a bit of Tilex Mold & Mildew Remover. Not to worry, I cleaned the whole top. I also wanted to add a steaming light that I didn't have before. A steaming light is required when you motor at night in addition to the red & green bow light and white stern light needed when you sail at night. I ordered a LED light from Amazon and then had to decide how to mount a flat backed light to a round mast. I didn't like how the light was sealed so I added some butyl tape to seal it up tight. I found an old washroom sign in the scrap metal bin at work. It was made out of a light stainless steel. My friend Danny cut it for me in his shop and I shaped it back at home in my shop. 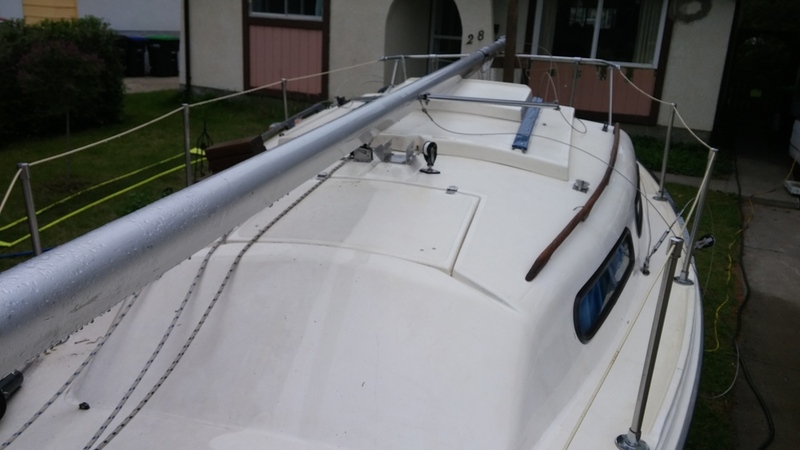 We fished the wires up the mast after drilling a 5/16 hole just above the spreaders. Danny soldered the wires and protected them with some heat shrink tubing. I then drilled 2 -1/8 holes on each side and mounted it with rivets. It turned out great. It's always fun to work on a project with a friend (beer).